Swatara Falls has become a well-known destination in Schuylkill County. And for good reason. It is a beautiful waterfall, about 25-30 feet in height, in an area of the state where there are relatively few waterfalls. The hike also looks down into a gorge with rhododendron jungles. Cliffs and huge boulders also rise over the trail near the falls, creating an impressive setting. How do you hike to it? It is fairly easy. I’m not sure who owns the falls. It is a popular place and appears open to the public. There were no “No Trespassing” signs that I encountered on this hike. All the trails follows old logging or jeep roads, and do not have blazes or signs. The hike is about 1 mile, one way. 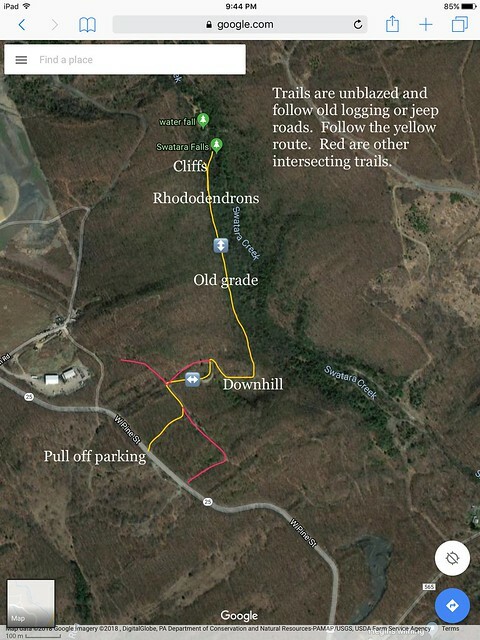 Cross PA 25 and hike up PA 25 for 75 feet to an obvious trail. Enter the woods. At first trail juncture, turn left. At second trail juncture, a four way juncture, turn right. At third trail juncture, turn right and descend. The grade curves down and then follows a level, straight grade above a rugged gorge. Rhododendrons grow along the trail. Follow this trail straight. 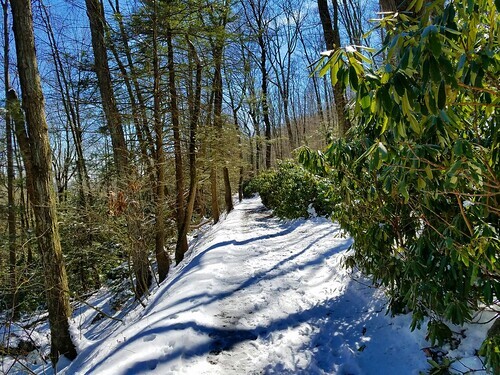 Rhododendrons become more thick but the trail is obvious. Cliffs and boulders rise above the trail. The trail ends at the falls. Return the way you came. Swatara Falls is a beautiful, rugged place with soaring cliffs and boulders. There is some graffiti. I’ve been told the creek is very scenic above the falls, with additional smaller falls. I’ve not seen them. To hike above the falls, cross the creek and scramble up. Please treat this place with respect and keep it clean. This entry was posted in Uncategorized and tagged Hiking, pennsylvania, swatara falls, waterfall by endlessmountains. Bookmark the permalink.